A world-class indoor training facility, the only one of its kind in the South East, this naturally lit and ventilated building is highly sustainable. Lee Valley Regional Park Authority wanted a world class indoor training facility, the only one of its kind in the South East. 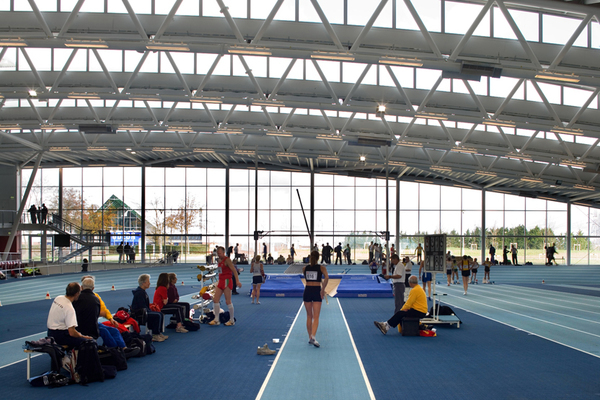 The Lee Valley Athletics Centre has the only 200m indoor track in the south of England. It also has a throws area, long jump and pole vault. There is a first floor 100m sprint track under which lies associated facilities such as a conditioning suite, changing rooms, a lecture theatre, as well as offices and meeting rooms. It is hoped that the centre will become an official training venue for the London 2012 Games. The building shape is taken from the space requirements for each sport taking place. By stacking them in this particular way the footprint of the building is the smallest possible, leaving more space for outdoor training. The indoor 200m running track has been sunk into the ground; normally it would have raised banks. This is so that the track is visible from ground level and all the spectator seats have good visibility. The earth that was excavated for this track was used to create banks around the outdoor track. These banks help reduce headwinds for runners and create informal spectator areas. The large columns to the west of the building are raked so that they are able to support the roof, creating a long-span open space. By placing them at an angle there is no need to provide cross bracing too, which gives a visual simplicity to their form. The roof is punctuated with north lights that provide natural light; during daylight hours there should be no need to use the electric lights too. The roof lights are openable which allows air to flow through the building, regulating the temperature and making it a more amenable training environment. The openable sections are covered externally by a shade which at a later point can be fitted with photovoltaic panel to further reduce the energy use of the building. The building recently received an A Grade Display Energy Certificate (DEC) which places it in the top 1% of public buildings for energy efficiency. Lee Valley Athletics Centre was officially opened by Tessa Jowell in January 2007.